Thanks, Carol. It took me a long time to realize that her traits do live within me and it’s up to me to control which ones. Yes, Nancy! What a compliment! There was a time when I didn’t think it was a compliment. I guess you could say that I grew up and realized all she sacrificed for me. So glad to “meet” your mom. Do your hands look like hers? Interesting questions about the hands. I’ll have to pull out some old photos and figure out the answer to that one. I do have some amazing stories about her. Thank you! 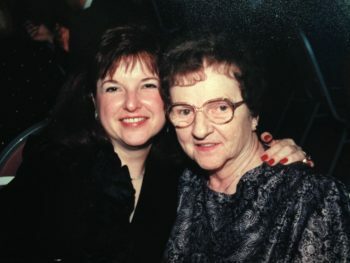 I had a Mom with a strong personslity. We were blessed. Yes, I feel very blessed as well. I really love having a strong personality and being able to voice my opinion. Thanks for sharing this story. She sounds like a wonderful Mother! What a nice compliment to receive! At a time when independence wasn’t always associated with women, she sure stood out. I have learned to be strong and independent because of her.